Du kan välja upp till totalt 3 resenärer. Zip runt Sofias historiska landmärken i en traditionell Trabant bil på denna privata 2-timmars tur. Lär dig om livet i Bulgarien under den kommunistiska eran när du passerar landmärken som det nationella kulturpalatset, det tidigare kommunistpartiets huvudkontor, det centrala varuhuset och statens arkivbyrå. On my short visit to Sofia, I cannot imagine choosing a better tour than this one. The wonderful tour guide was full of all kinds of fascinating stories about local history, but also told me about his own family's experience, and that was really meaningful to hear about. The car is amazing, and that seatbelt is a doozy! It was an extremely worthwhile, interesting, and engaging historical experience, and I highly recommend it! Very good tour. We were picked up from our hotel and driven around Sofia, stopping at various locations. 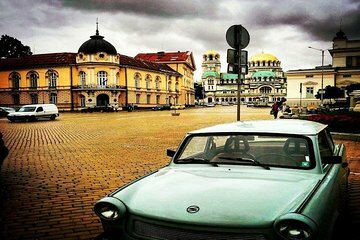 Our guide was interesting and knowledgeable and told us about the history of Sofia from the perspective of the communist era. The tour lasted just over 2 hours and it was great being driven around in a classic car.